Hawthorne Cottage01263 715779work01603 870304fax Self-cateringThis semi detached cottage has been delightfully furnished and is situated within close proximity to the coast. The use of the onwer's indoor heated salt water swimming pool will be an added attraction. This village, has a pub, shop and award winning fish and chip shop.which offers an excellent selection of walks. • General: Electric heating and woodburner. • Notes: Use of the owner's salt water swimming pool with Jacuzzi jets, comfortable seating, TV with Sky, Treadmill. Pool table. The swimming pool is available between the hours of 8am and 3pm and is shared between all three cottages. Please note there is no lifeguard, so an adult must supervise children of any age at all times and nobody can use the pool area on their own. No alcohol is to be consumed in the pool area. The pool area is closed from Jan - End March. Hawthorne Cottage offers weekly bookings starting on Saturday. 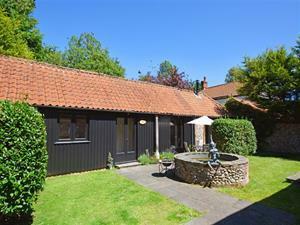 This semi detached cottage has been delightfully furnished and is situated within close proximity to the coast. The use of the onwer's indoor heated salt water swimming pool will be an added attraction. This village, has a pub, shop and award winning fish and chip shop.which offers an excellent selection of walks.